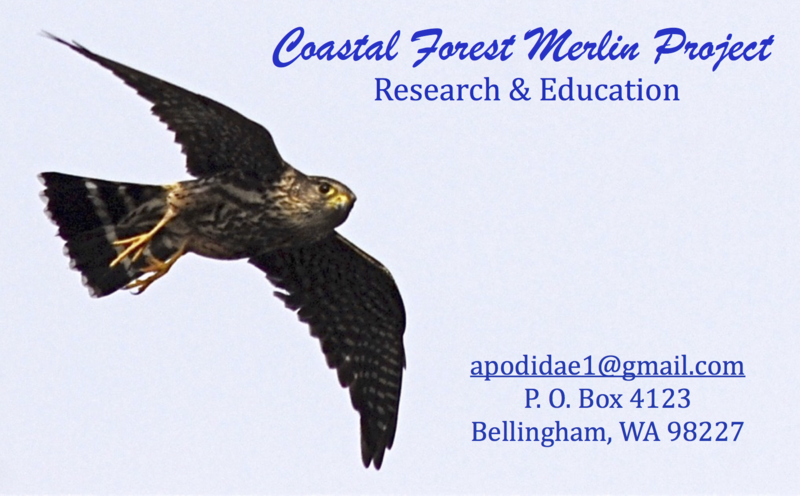 Merlins have a variety of vocalizations (calls). Published literature on Merlins suggests that their call is a high-pitched version of the larger falcons. Falcons have a staccato cadence. The standard male Merlin’s call is described as a kee-kee-kee, similar to the Douglas Squirrel of the Northwest, but slightly higher and shorter. This sound frequency travels very well in semi-open forest canopies (tree tops). One of the female calls is similar to the male but lower-pitched. Other vocalizations accompany different behaviors, i.e. food soliciting, agitation, when near the nest, and defending the nest against predators. Merlins may also sound like a Dark-eyed Junco male singing, American Robin male agitation call, Northern Flicker, Pileated Woodpecker, or other species when heard at a distance with wind or creek sounds partially masking or obscuring the call. Commercial bird recordings present a captive Merlin who is given food and then the food is taken away; the Merlin responds with an upset or agitated call in response.